With historic roots as far back as 1824, Port Macquarie has long been seen as a vibrant retail, industry and tourist destination. The importance of creating a fresh, attractive and prosperous CBD has been recognised by locals dating back to 1989 when a special levy on Port Macquarie CBD property owners was formally introduced for streetscape, landscaping and beautification works. 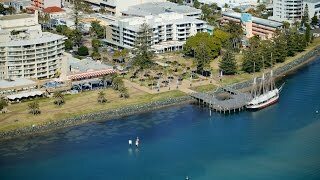 Following this, the Port Macquarie Town Centre Master Plan (TCMP) Sub-Committee, a joint initiative of Port Macquarie's CBD property owners and Council was formally established in February 1994. The Sub-Committee was to assist in continuing to develop the Port Macquarie Town Centre Master Plan, proposing works priorities, making recommendations regarding the development, review and amendment of the Master Plan and acting as a communication conduit between Council and CBD stakeholders advocating the Master Plan to the community. Since the establishment of the TCMP, total works funded, capital and refurbishment, as well as maintenance and operational activities, have been in excess of $15 million. The TCMP Sub-Committee is made up of Council staff and representatives of Port Macquarie CBD landowners, traders, community member and both the Port Macquarie Chamber of Commerce and Port Macquarie-Hastings Access Committee. "The TCMP Sub-Committee is absolutely committed to ensuring that our CBD takes all steps necessary to ensure that its long term future as an attractive, vibrant space is substantially enhanced in the years ahead. We have a business model and far sighted plan that is the envy of regional Australia and it is our passionate wish to leverage that position with appropriate care, energy and wisdom." - Councillor Geoff Hawkins, Chairperson Town Centre Master Plan Sub-Committee. To purchase a copy of the 'Port Macquarie Downtown' book by Peter Denton, outlining the colourful history of Port Macquarie's CBD and the Town Centre Master Plan please contact the Historical Museum opposite the old courthouse. If you can see this text, your browser does not support iframes. View the content of this inline frame.